City of Maryville facilities available for reservation are the pavilion and the amphitheater at Theater in the Park (Jack Greene Park.) All other park facilities are reserved through Parks and Recreation (865) 983-9244. 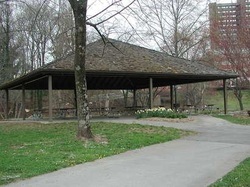 The Greenbelt Pavilion is located on Lamar Alexander Parkway/ U.S. Hwy 321 near the Blount County Courthouse and Theater in the Park. The Pavilion is available to the community for picnics and similar activities by reservation on a first-come, first-served basis. If you wish to use the pavilion for a Special Event which will be open to the public, you may be required to complete an application located on the "reserve Theater in the Park" page. The pavilion is wheelchair accessible from the parking lot at the entrance and connects to the Greenbelt via paved walkways. There is no charge to use this facility. Reserving the Greenbelt Pavilion is limited to the pavilion itself. In order to have access to electricity, reservations must be made at least 2 weeks in advance. The Theater and the Theater grounds as well as the Blount County Government parking lot are not included in this reservation. To reserve the pavilion, please call (865) 273-3407 between the hours of 8 a.m. and 5 p.m, Monday-Friday. Leave a message of the date and time you are requesting. Theater in the Park, located on Lamar Alexander Parkway near the Blount County Courthouse, was dedicated in August of 2000 to Charles West Sr. in honor of his desire to bring music to our community. 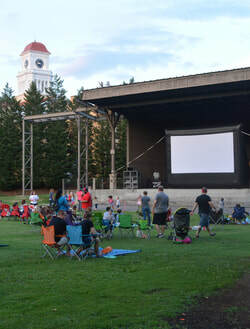 The West Theater has provided the area a first class outdoor theater venue. Community events held each year include a symphony performance by the Knoxville Symphony Orchestra, Movie Nights, and Choral concerts. For fifteen years, the venue was home of the nationally recognized Foothills Fall Festival. Organizations or individuals interested in reserving the facility must complete an application, provide a deposit, meet the requirements within the contract, and be approved by the City of Maryville. Dates for 2017 may be reserved beginning January 1, 2017. Events must be open to the public without charge. Please call 865-273-3407 to reserve your preferred date prior to sending application. Fundraising is not allowed on city of Maryville public property.